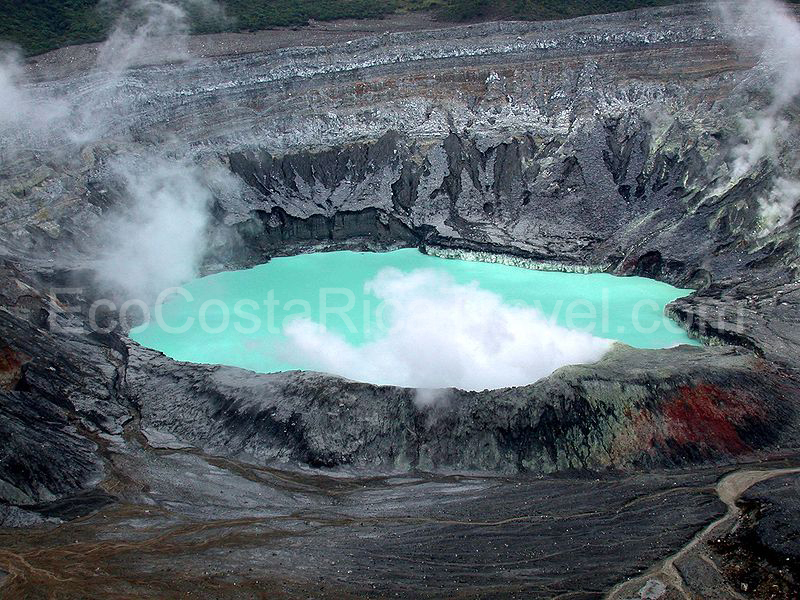 One of Costa Rica’s most active volcanoes, Poas Volcano, is also one of the most visited and most prominent. There have been 39 recorded eruptions since 1828. It is considered to be one of the most breathtaking sights in the whole country. Almost 9,000ft in elevation, Poas Volcano sits on top of over 14,000 acres of protected plant and wildlife which make up the Poas Volcano National Park, located just 1 1/2 hours from San Jose. There are 2 crater lakes near the summit. The lake to the north, called Laguna Caliente (hot lagoon) is about a mile wide and about 1000ft deep. It is one of the worlds most acidic natural lakes and due to the constant rain and changes in volcanic activity, PH levels vary and often reach 0, which means the lake supports little to no aquatic life. But it sure is beautiful! This lake often changes colors, from emerald green to grey and you can even see bits of yellow (sulfur) floating around. Temperatures have been known to reach 94 degrees. And if the beauty of it alone isn’t enough, the extreme heat cause by the magma below turns the water and acid into steam, shooting into the air like a geyser. Lake Botos, the lake to the south, takes up residence in an inactive crater. The last eruption was in 7,500 BC. 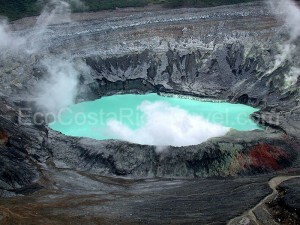 It is surrounded by cloud forest inside of the Poas Volcano National Park. It stretches a little over 1,300ft in diameter and is cold and clear. It sort of gives off an eerie feeling, definitely well worth it to see. Although wildlife at these elevations isn’t plentiful, there are a large number of bird species you’re likely to see once the mist and fog clear. Quetzals, sparrows, hummingbirds and black guans are a few you’re likely to spot. You also might have a chance, however, of spotting some small mammals like coyotes and rabbits. Poas Volcano is an excellent example of how acid rain affects vegetation. Acid gases create acid rain and fog, causing damage to its surrounding ecosystems. It is truly fascinating to see the remnants of those effects. This is definitely a must see during your travels to Costa Rica. Stop by the visitors center to learn about the story behind this historical volcano.